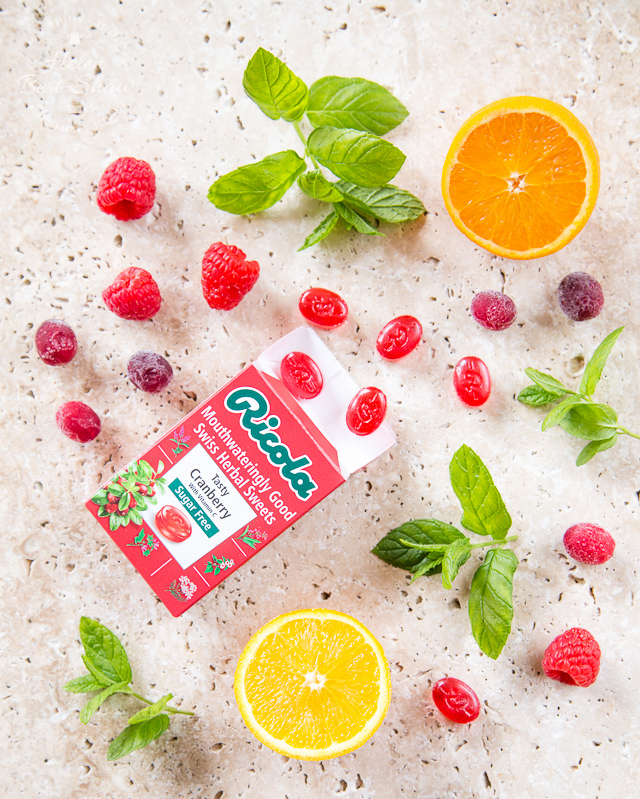 This refreshing herbal cranberry, raspberry and orange mocktail is made with a surprising secret ingredient – Ricola boiled sweets! Come the heat of summer I quite often do not want a alcoholic drink and will settle for a iced refreshing mocktail instead. I am often surprised at just how bad the soft drink selection can be in some pubs and restaurants in the UK, sometimes you strike it lucky, but all too often the choice is limited to juice or sweet fizzy drinks, at a disproportionate price. 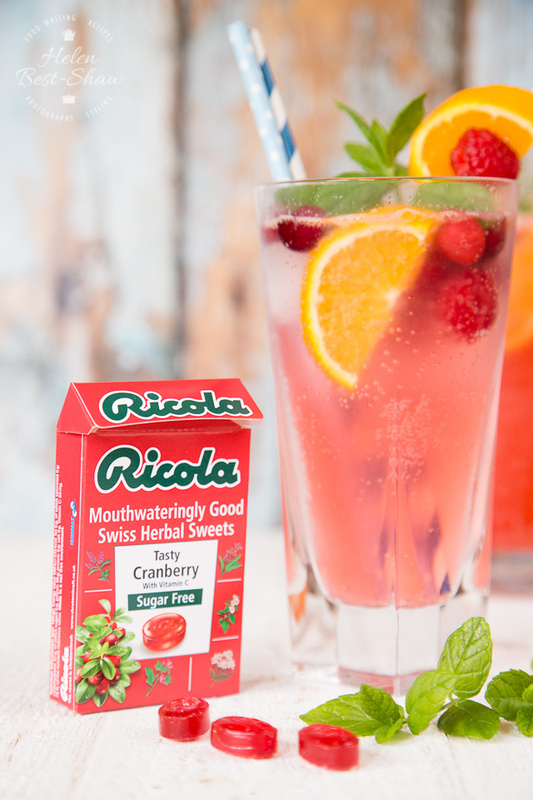 This lightly sparkling cranberry, raspberry and orange cooler has a surprising ingredient – Ricola Swiss herbal sweets! I have rather a soft spot for Ricola; as they remind me of my past trips to the mountains of Switzerland. Firstly for ski trips, then summer holidays in the mountains near to Interlaken, where I walked through lush green alpine meadows filled with same the flowers and herbs as depicted on the packets. As much as I adore winter sports, I think that the mountains are equally beautiful in the summer, and I am well overdue a visit. Ricola has been making their herbal sweets; each containing a secret blend of 13 mountain herbs, including peppermint, marshmallow, sage and thyme since 1940. There are now 10 flavours; complex, packed with taste and not too sweet. A very grown up sweet indeed. To make this drink, simply put the sweets into a mug, then cover with boiling water and leave to dissolve. You need a little patience, but with time the Ricola will completely dissolve. 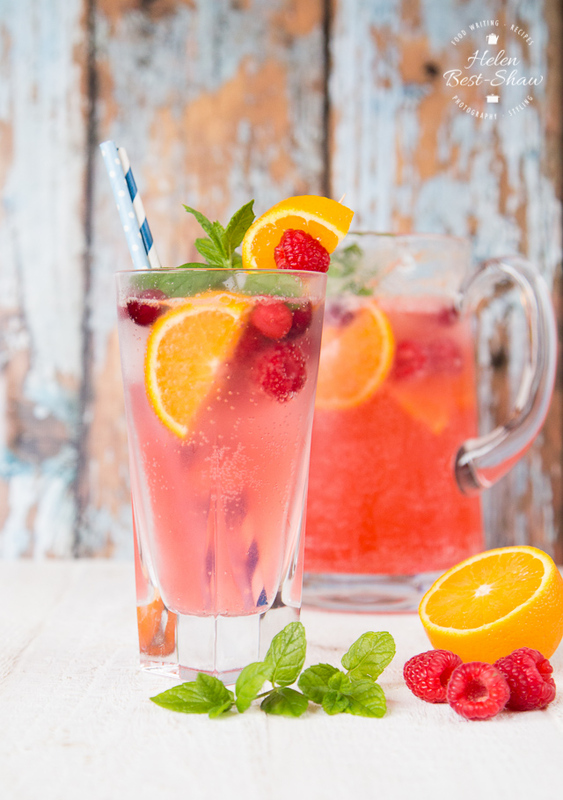 If you try this Cranberry, Raspberry and Orange Sparkling Cooler please tag #FussFreeFlavours on Instagram or Twitter. It is amazing for me when for me when you make one of my recipes and I really do love to see them. You can also share it on my Facebook page. Please pin this recipe to Pinterest too! Thanks for reading Fuss Free Flavours! 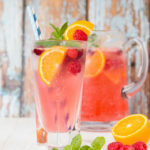 This refreshing herbal cranberry, raspberry and orange mocktail is made with a surprising secret ingredient - Ricola boiled sweets! Place the Ricola into a mug, and pour boiling water over. Set to one side and allow to dissolve. Once dissolved add the raspberries (reserve a few for garnish) and blitz in a blender. Strain into a jug through a sieve. Add the remainder of the raspberries, sliced orange, mint and fresh cranberries if using, stir, and put in the fridge for a few hours to infuse. When ready to serve top up the cranberry mixture with chilled sparkling water and plenty of ice.